Today we have a few absolutely stunning layout shares featuring the April Papercrafting Kits (just a few left!) from Karine to share with you. Be sure to keep your eye on her blog as I'll sure she'll be sharing detail shots of these beauties soon. Thanks for the inspiration Karine! Like many of you, I fell in love with the April monthly kits! Glitter, ribbon, lace, and shining alphas: I couldn’t resist! It made me want to take out again some sweet and poetic pictures that I particularly like. 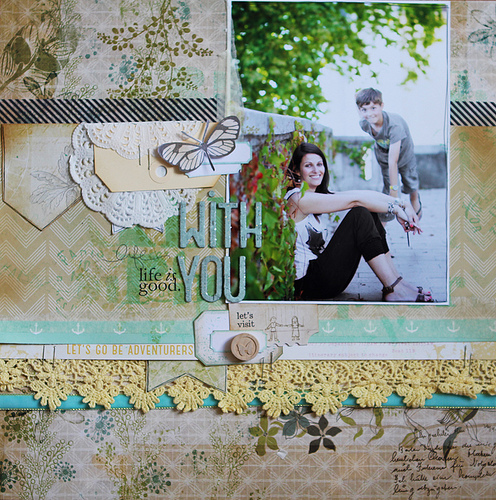 My first two pages "Life is good" & "Love" have been created using the April Mini-Album Kit! The subtle mix of colours is really nice, especially the sea-green one. I wanted to create a light atmosphere on my backgrounds, so I simply added a few stamps. The lace brings some texture and femininity. Now it's colour time with the April Papercrafting Kit and Artisan Add-on! 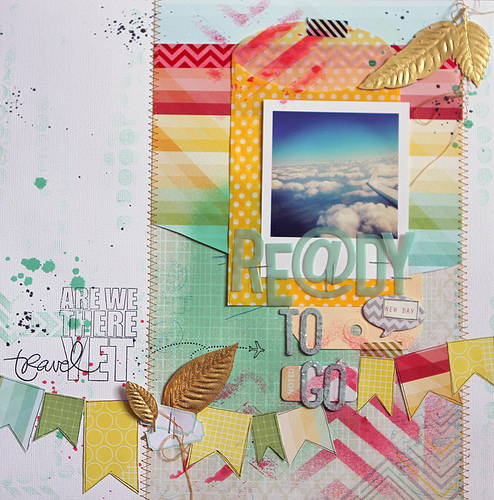 With this “Ready to go” layout, I wanted to work on a “need to escape" theme. A very dynamic combination wrapped with a hint of gold! 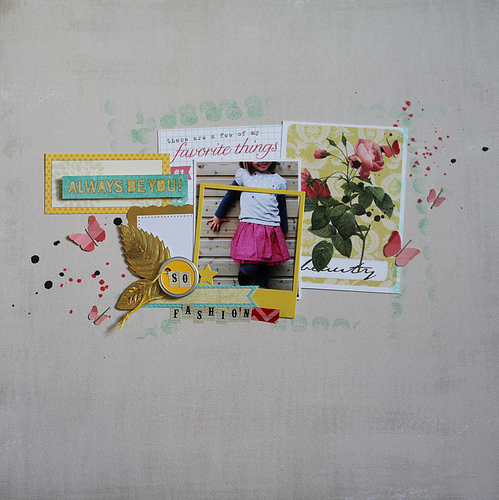 With this kit's paper scraps, I also created a very simplistic and feminine lay-out starring my niece: “So Fashion”. 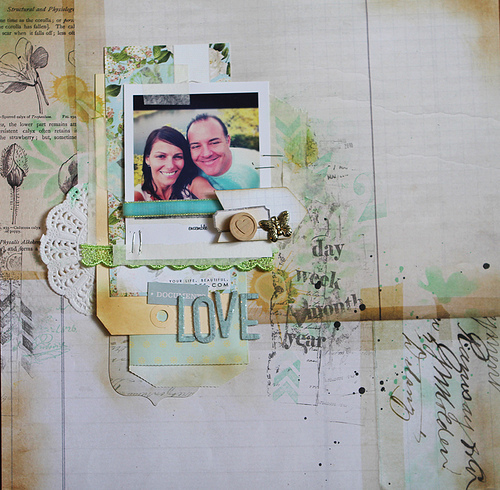 I had fun using these scraps of paper and the fabulous Glitz Design stamp from the kit. I simply added some ink splashes as a finishing touch. We have started this month in a nice way! As always with the Jenni Bowlin Mercantile Kits! Oh Happy Day! See you soon with projects from our May Kit offerings! BRILLIANT WORK!!! Love these so much!